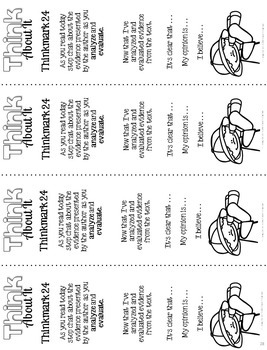 Thinkmarks are a special type of bookmark that encourage students to think as they read. Each thinkmark focuses on a reading strategy that good readers use to understand the text. Students can use the thinkmark to apply strategies that have been presented in whole class lessons. Thinkmarks can be used during whole-class, small group, partner or independent reading. They’re also a wonderful tool to send home with homework assignments. 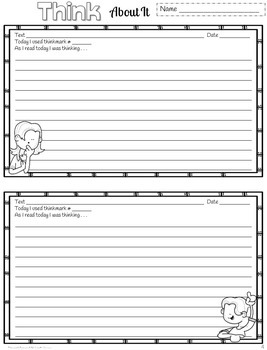 For more accountability students can write about their thinking after they read. A recording sheet is included with space to write two entries. The entries can also be cut out and added to a reading journal. This packet includes 30 Thinkmarks. Although the strategies are repeated throughout the 30 thinkmarks, no two thinkmarks are exactly the same. Each thinkmark has a slightly different focus. 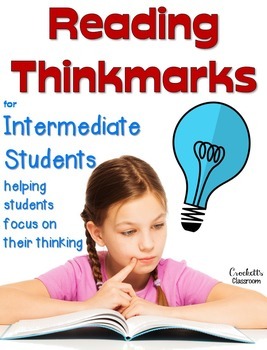 Thinkmarks would be an ideal addition to literacy centers, journal entries, homework reading accountability or paired with class reading lessons. I've used thinkmarks with my small guided reading groups. After presenting and discussing a reading strategy each student takes a thinkmark and uses it during independent reading time. At the next group meeting we'll look over the thinkmarks discuss and review the specific skill. I can quickly see if students are beginning to use these skills on their own or if we need more instruction or practice. ***These Thinkmarks are also part of my Fourth Grade Literacy Centers. They are included in the center "Chat About It" If you've purchased those centers, you will not need this packet.